From the reflection given by Sheila Carney rsm at MIC on 11 November, 2010 and linked to this item. We pray for Sisters of Mercy throughout the world, for our Associates, Partners in Ministry and all members of the global Mercy family, that Catherine's life and death may continue to call us to embrace the spirit of hospitality and service. Catherine McAuley was the first to be buried in this garden cemetery, consecrated at the time of her death in 1841. Thirteen women died at Baggot Street prior to Catherine, and they are buried in the crypt at St. Teresa’s Church on Clarendon Street. 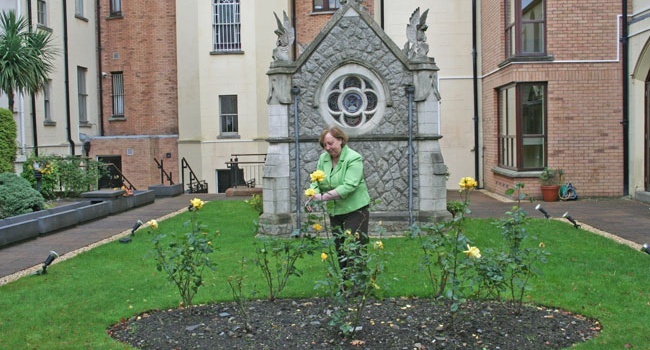 Be among the many people whose names are printed forever on plaques around the area of the ‘Wall of Remembrance’ in the garden of Mercy International Centre, where Catherine McAuley is buried. A contribution to the equivalent of €500 will ensure your name or the name of a loved one – living or deceased – is prayed for and remembered forever. General donations are always welcome! The programmes for 2015 are online here, the printed version of the programme is in the mail and a PDF of the programmes has been prepared for circulating by email, posting on noticeboards and including in mailouts. We appreciate your assistance in promoting the 2015 programmes among your community members, associate groups, staff, boards, friends...anyone you think may be interested in spending time at Mercy International Centre in 2015, the year we celebrate twenty-five years of Catherine being pronounced Venerable . God of love and mercy, touch with your healing power and restore to full health Daragh, Patrick and Brian, Kevin Lowther, Fionbar and all whose names are on our prayer list. The Sisters of Mercy of Belfast and Downpatrick and the entire Mercy Community in the Northern Province, together with Fr. Brendan Duddy S.J., Fr. Peter Forde P.E., their families and friends, sincerely thank everyone who helped and supported them in their sadness and loss at the sudden deaths of Sisters Marie Duddy and Frances Forde RIP. Editor: Twelve months ago (8 November 2013) the Philippines was hit by Super Typhoon Haiyan. In Mercy Enews on 13 November 2013 we wrote 'As a human tragedy, the scale of the disaster is so enormous that it is almost beyond our comprehension. What makes this tragedy especially compelling for us is that our own Sisters are significantly effected.' For three successive days — 13, 14, 15 November 2013— we published special Enews issues focussed solely on the disaster and our Mercy response. (The only other occasion when we have published successive Enewsletters on an issue of shared Mercy concern was the 20th Anniversary celebrations in September 2014). In December 2013 we published a one month situation report on the Philippines. This was followed by the report from Mary Reynolds rsm on her visit in April 2014 to see how the funds raised and donated by MIA were helping restore hope, rebuild infrastructure and transform lives. '...A year or 12 months from then, traces of that devastation can still be felt, particularly among the poor people who not only lost their homes and their loved ones but their means of livelihood as well. Further detail, including a photo gallery and a video clip (03:52) made by the Sisters from their images of the devastation and of restoration, is linked to this item. The Congregation of the Sisters of Mercy is a Catholic Religious Women's Congregation. Catherine McAuley founded the Sisters of Mercy in 1831 in Dublin, Ireland. Her aim at that time was to 'care for the poor, sick and ignorant'. Today, 2,324 members of The Congregation follow in the footsteps of Catherine McAuley, in 9 countries. MIC offers bed & breakfast facilities to Sisters of Mercy, Associates, co-workers and family and friends of Mercy. Single & double/twin share rooms are available. Bathroom facilities are shared. A sitting room with TV, coffee, tea & biscuits is available for guests all day. Breakfast is served in the dining room at 8.30am daily. Our beautiful chapel and garden cemetery provide spaces for prayer and reflection. Internet access and laundry facilities are available for guest use. Those members of the Mercy family able to be present in person or online on 24 September for the Mercy Day Prayer Service or Mercy Day Mass will clearly remember Sr Teresa's singing of her musical composition of Catherine's Suscipe. Listen again this Remembrance Day. The Suscipe is linked to this item. This version of the Suscipe has been recorded and is available on Teresa's album, Cothú agus Iomlánú, a collection of her Mercy inspired compositions. From Catherine's Room in Baggot Street, Mercy Associate Anne Reid narrates an account of the last days and death of Catherine McAuley (14:05).